I has a mail request/wishlist to sort layers in alphabetic order. 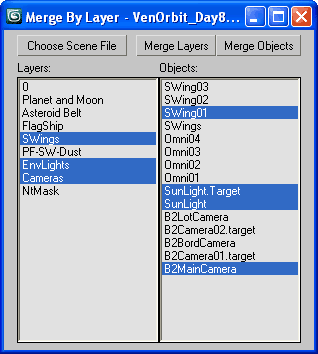 I add this option for both - layers and objects lists. The option should been checked before choose scene file. Submitted by titane357 on Mon, 2011-01-31 06:36. - you could select/multiselect in right column object(s) of one selected layer u want to merge. Submitted by Anubis on Mon, 2011-01-31 04:40.
well, the idea was to merge by layer, but your request sounds sensibly. 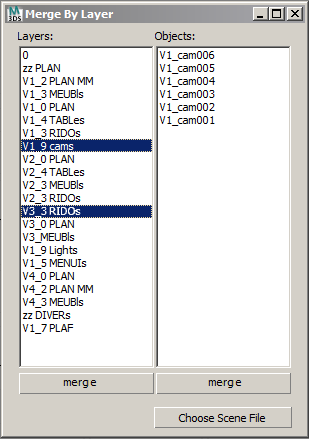 What if the objects list is MultiListBox and then double click on layer to merge selected objects? Also maybe the objects will been selected all by default? I just think how to keep the UI simple as is. What you think about? Submitted by tassel on Sun, 2011-01-30 15:13. Very nice script. Going to help me every day at work. Submitted by titane357 on Sun, 2011-01-30 13:05. Could it be possible to merge just some Objects of one layer ? Submitted by Anubis on Fri, 2011-01-28 13:30. Submitted by titane357 on Thu, 2011-01-27 11:33.
sorry, the 3 first scenes I tried was 2009, and didn't work with 2011 I use. Submitted by JokerMartini on Thu, 2011-01-27 10:44. Submitted by Anubis on Thu, 2011-01-27 08:13.
its just a quick script and making it resizable is not a problem, but the rest notes is not clear to me. just double click on item in Layers list to merge. and how much old scenes? layers was added in Max 4. Submitted by titane357 on Thu, 2011-01-27 06:38. - window should be resizable : it is better to see much item of same layer without scrolling.